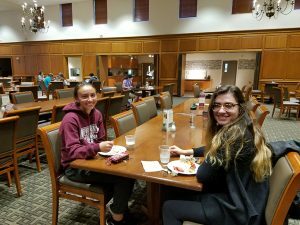 The breakfast crowd is thin at Marquis Dining Hall, where Sophie Saldivar ’21 and Krista Kissell ’21 are chatting. The first-year students have perfect timing. They just missed the initial rush of the day—those who fuel up before 8 a.m. classes—and are ahead of the second wave of diners, who will roll in prior to 9:30 classes. So Saldivar’s eggs and turkey bacon and Kissell’s strawberry-and-banana crêpe required no wait. Saldivar, who is undecided on her major, and Kissell, who plans to major in economics, met on campus in August as members of the women’s soccer team. Neither has a class today until 1:15 p.m., but a 7:15 a.m. athletic training meeting necessitated an early start. Other than that morning meeting, today is an “off day” for the soccer team. And not because it’s raining. Players get one rest day a week, and Saldivar, a midfielder from Pasadena, Calif., and Kissell, a forward from Cresco, Pa., already know how they’ll be using the extra three hours: “Studying,” they say in unison. Both have upcoming Economics 101 exams. If their breakfast scheduling is any sign, they are already time-management pros. Read the other stories in today’s Life as a Leopard feature.